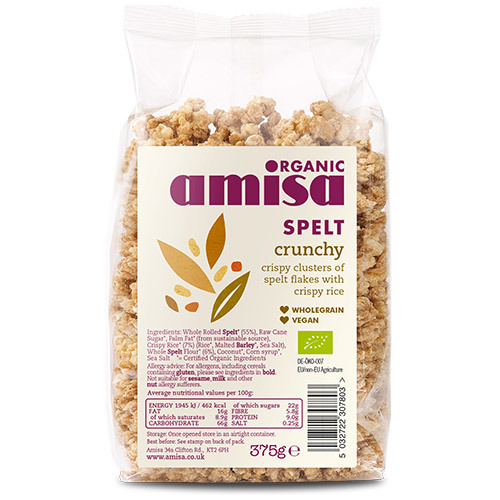 Amisa Organic Spelt - Crunchy is a light and delicious start to your day! Crispy clusters of spelt flakes with rice crispies. Enjoy as a healthy snack. Spelt is one of the oldest cultivated grains and is an ancient cousin of wheat. It is high in fibre, has a higher content of protein and vitamins than wheat and although not gluten free, spelt can be tolerated by some people with wheat allergies. 800 years ago, Hildegard von Bingen (Saint Hildegard), a mystic and composer, taught the importance of spiritual and physical wellbeing. Hildegard endorsed spelt saying: "Spelt is the best of grains. It produces a strong body and healthy blood for those who eat it". Amisa is a brand created by Windmill Organics Ltd, a company committed to providing high quality organic food for everyone to share and enjoy. Amisa provide nutritious, healthy, organic foods that care for consumers with special dietary needs. Whole Rolled Spelt* 60%, Raw Cane Sugar*, Palm Fat* (from sustainable source), Rice Crisps* 7% (Rice, Malted Barley, Sea Salt), Whole Spelt Flour* 6%, Coconut*, Corn Syrup*, Sea Salt. Enjoy as a healthy snack. May contain traces of various lactose, nuts and sesame seeds. 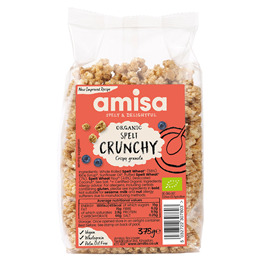 Below are reviews of Amisa Organic Spelt - Crunchy - 375g by bodykind customers. If you have tried this product we'd love to hear what you think so please leave a review.